According to the World Health Organisation, around 350 million people, from children to adults, suffer from depression. Chances are that you have known someone what has suffered from depression, or perhaps even you have experienced this devastating and debilitating disease. Depression can be chronic and can greatly affect someone’s ability to function at work or school, and even prevent that person from creating lasting and successful relationships. For those who suffer from depression, there are a range of treatments to choose from, including medications. Prescription medications all come with side effects; some only minor while others can be quite serious. Therefore you might be looking for something a bit more natural, or something with few or no side effects to treat your depression or difficult moods. While searching the web for something to raise our spirits when we’re in a slump, we found the Native Remedies company. Native Remedies is a supplement company that aims to ’embrace a natural approach to complete family wellness.’ Born out of a desire to find more natural treatments for those suffering from ADHD, the founders of Native Remedies have expanded their reach and now produce products aimed at not only learning and focus, but also mood, tension, dizziness and balance. 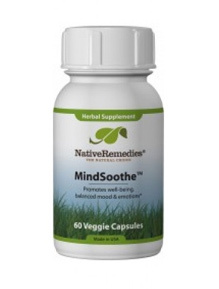 In particular, we decided to check out MindSoothe, an herbal supplement that supposedly soothes a troubled mind. The creators of MindSoothe claim that its al-natural formula helps someone ‘maintain emotional health and systemic harmony in the brain and nervous system. So what’s so special about this formula? Well, what immediately gave us a slight shock was that MindSoothe only contains two ingredients. With many formulas containing twenty or more ingredients, we were immediately intrigued. What is so special about these two ingredients? The first ingredient in MindSoothe is St.John’s wort, or hypericum perforatum. St. John’s wort is a medicinal flowering plant that is native to Europe and Asia, but has now spread across the world. Numerous verifiable studies have shown that St. John’s wort can have a positive effect on those suffering from depression. Scientists believe that St. John’s wort inhibits certain neurotransmitters and therefore lead to a heightened mood. In fact, there have been several studies done in the United States and in Germany that have shown that in some instances St. John’s wort is superior to placebos and in fact may be just as effective as prescription medications. However, there have been other studies that have shown that St. John’s wort is no better than a placebo, but interestingly enough, those same studies also showed that certain prescription drugs did no better than the placebo either. What is known is that depression is difficult to treat, and since St. John’s wort has fewer negative side effects than prescription drugs, it may just be worth trying it out. Overall, St. John’s wort is well tolerated, and the most commonly reported side effects were nausea and dizziness. However, it is important to note that St. John’s wort is not recommended for those with bipolar disorder and it may not be suitable for those who are pregnant and those taking certain prescription drugs. The next and final ingredient in MindSoothe is passion flower. Passion flower, scientifically known as passiflora, includes about 500 different flowering plants. The specific kind found in MindSoothe is known as passiflora incarnata, which is also commonly known as maypop. It is an intricate yet beautiful perennial flower that grows on a vine and is commonly found throughout the south-eastern United States. For years passiflora incarnata has been used to soothe anxiety and treat insomnia. It can be used fresh or dried and is sometimes taken as a tea. Several studies have been done on passiflora incarnata and in particular one study found that the effects of passiflora incarnata were similar to certain prescription medications. Other studies have shown that passiflora incarnata can be effective in treating the symptoms related to the withdrawal from and addiction to alcohol, nicotine, and certain prescription medications. Although the exact science is unclear, passiflora incarnata is thought to provide relief from anxiety and insomnia by increasing the levels of the GABA chemical in the brain. Again, the exact process is unclear, but it is thought that a loss of normal function of the GABA system in the brain may explain several neuropsychiatric conditions. Once the correct balance of GABA is restored, certain people find relief from their symptoms. MindSoothe comes in both a vegetarian pill form and a tincture. Reviews are generally positive, although many people noted that they felt no difference in their symptoms. Also, one bottle is pretty expensive, coming to forty USD after taxes and shipping, which depending on you take it, may last around one month. Overall, we were impressed with MindSoothe, although we were uncertain if the expense was worth it, since it would take several months before we would most likely see a difference. If you have the time and money, you may think about trying MindSoothe, but we think we could find those two ingredients separately for cheaper and simply create our own stack.